Flexible System - The new Vineyard Management just in 3 steps! The concept of the system is to raise the wires up and down according to the vineyard season. 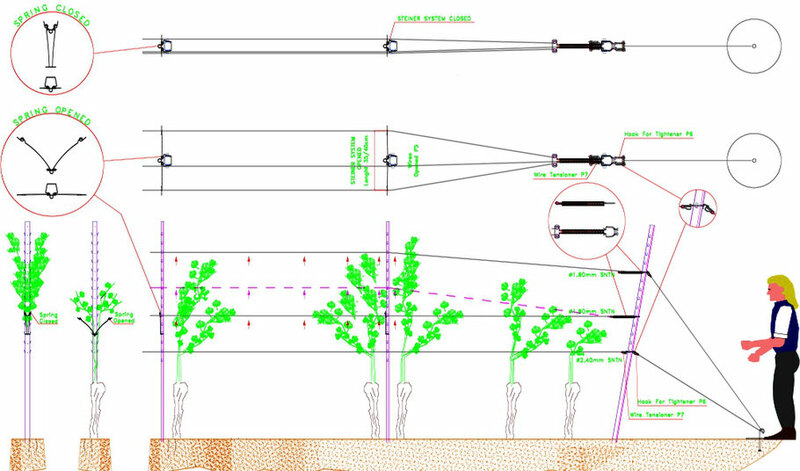 The new way of vegetation handling has created an automatized vineyard management. 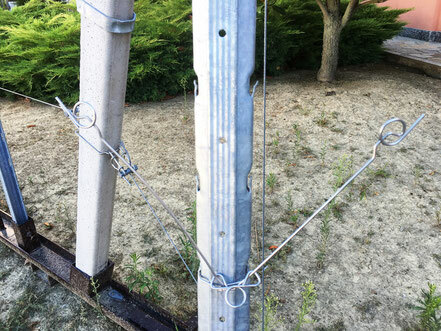 Before all, the operators need to install both accessories on the Vineyards Posts chosen by the customer. Both tools can be produced for the most famous Vineyards Posts present on the market. Our experience suggests to use Metal posts as the intermediates ones, and Concretes or Wooden Posts for the End ones. Feel free to call us a Perfect Vineyard Trellising System. Leave the Spring Speader IWT-Steined opened (35-40 cm). Mainly these tools/accessories are installed in winter time while the vegetaion is quite stop due to the cold weather. The Spring Spreader IWT-Steiner must kept opened on all the intermediates Metal Posts. After Winter time is over and the vegetation begins to grow, keep an eye on how easily the vine-shoots go inside into the first couple of wires. 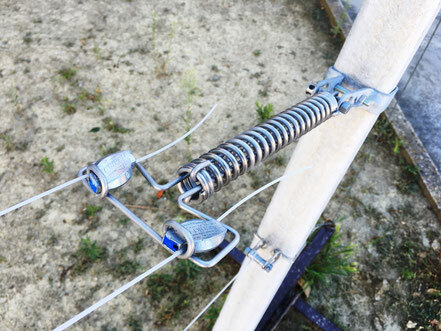 Accessories for Vineyards suggests to use a Spring Spreader on the first couple of wires in order to not break any young shoots just born. In this phase, the shoots are so tender and we believe that they have not to be stressed by the use of tension spring only. Thanks to the distance from 35 to 40 cm, 85-90% of the vine-shoots grow automatically inside. No work is done by the operators. The spring spreader does it! It's time now to close the Spring Spreaader IWT Steiner to contain the vegetation. As we may know, the vegetaion keeps growing. It's time to use the special Eyelet of the Springs. Thanks to this special Eleyet, the operator clicks out the wire and follows the vegetation growing raising up the wire. This movement is possible thanks to the Tension Spring set up on the End Posts. The compression spring gives the right flexiblity to whole structure. This system has been studied for different Vineyards Structure. The springs can compensate different Length. With the Normal Spring Effemme 2.0 you can manage Vineyards from 0 - 100 meters. By the use of the Effemme 2.0 "Maxi" you can manage Vineyards up to 300-400 meters. Once the Vineyard Cycle is over, it's time for the Winegrowers to think about the Winter Operations, Pruning above all. In this case, we suggest to move the couple of wires down of the main wires in order to have a big space and a free canopy. This way, it is easy the shoots removing even if it is manual or automatized by the use of Pruner Machineries.